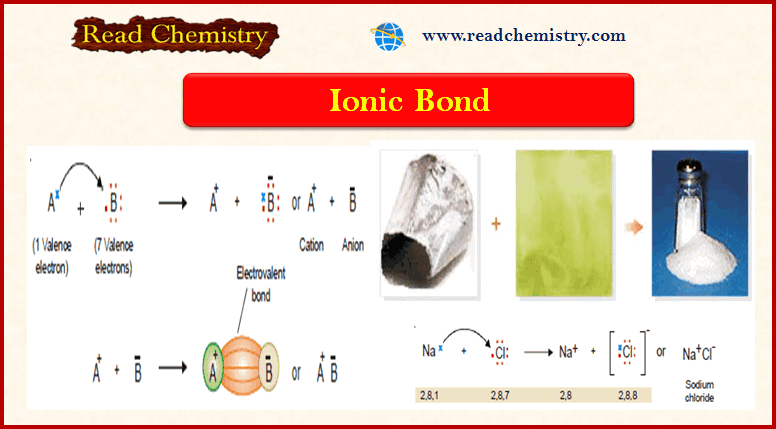 ** This type of bond is established by transfer of an electron from one atom to another. ** Let us consider a general case when an atom A has one electron in the valence shell and another atom B has seven electrons. A has one electron in excess and B has one electron short than the stable octet. Therefore, A transfers an electron to B and in this transaction both the atoms acquire a stable electronoctet. ** The electrostatic attraction between the cation (+) and anion (–) produced by electron transfer constitutes an Ionic or Electrovalent bond. ** The compounds containing such a bond are referred to as Ionic or Electrovalent Compounds. ** The atom A should possess 1, 2 or 3 valence electrons, while the atom B should have 5, 6 or 7 valence electrons. ** The elements of group IA, IIA and IIIA satisfy this condition for atom A and those of groups VA, VIA, and VIIA satisfy this condition for atom B. (a) The removal of electron from atom A (A – e– → A+) requires input of energy, which is the ionization energy (IE). It should be low. (b) The addition of an electron to B (B + e– →B– ) releases energy, which is the electron affinity of B (EA). It should be high. (c) The electrostatic attraction between A+ and B– in the solid compound releases energy, which is the electrical energy. It should also be high. ** The net energy released is 187 + 85 – 119 = 153 kcal. Since the overall process results in a lowering of energy, the ionic bond between Na and Cl will be formed. ** From the line of argument used in (2), we can say that atoms A and B if they have greatly different electronegativities, only then they will form an ionic bond. 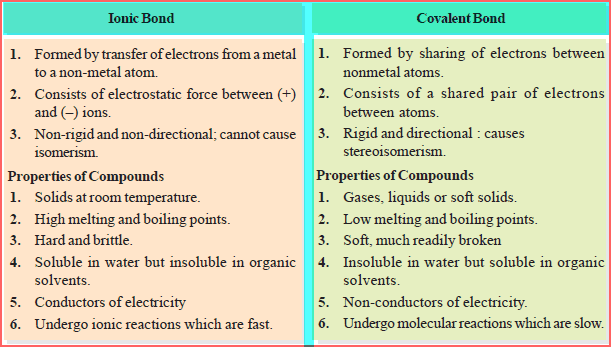 ** In fact, a difference of 2 or more is necessary for the formation of an ionic bond between atoms A and B. ** Thus Na has electronegativity 0.9, while Cl has 3.0. Since the difference is (3.0 – 0.9) = 2.1, Na and Cl will form an ionic bond. formation of +vely charged ion is easier. ** Lower the ionization energy greater will be the tendency of the metal atom of change into Cation and hence greater will be the ease of formation of ionic bond. That is why alkali metals and alkaline earth metals form ionic bonds easily. ** Out of these two, alkali metals form ionic bonds easily as compared to alkaline earth metals. ** In a group the ionization energy decreases as we move down the group and therefore, the tendency to form ionic bond increases in a group downward. Due to this reason Cs is the most electropositive atom among the alkali metals. ** The atom which accepts the electron and changes into anion should have high electron affinity. ** Higher the electron affinity more is the energy released and stable will be the anion formed. ** The elements of group VI A and VII A have, in general, higher electron affinity and have high tendency to form ionic bonds. Out of these two, the elements of group VII A (halogens) are more prone to the formation of ionic bond than the elements of group VI A. In moving down a group the electron affinity decreases and, therefore, the tendency to form ionic bond also decreases. ** After the formation of cations and anions separately, they combine to form ionic compound. In order to have the greater force of attraction between the cations and anions their size should be small as the force of attraction is inversely proportional to the square of the distance between them. ** Greater the charge on ions greater will be the force of attraction between them and, therefore, greater will be the strength of the ionic bond. ** Necessary for the formation of an ionic bond between atoms A and B. Thus Na has electronegativity 0.9, while Cl has 3.0. Since the difference is (3.0 – 0.9) = 2.1, Na and Cl will form an ionic bond. Here we will discuss the formation of Lewis formula or Electron dot formula of some binary ionic compounds, for illustration. ** Na (2, 8, 1) has one valence electron, while Cl (2, 8, 7) has seven. Na transfers its valence electron to Cl, and both achieve stable electron octet. Thus Na gives Na+ and Cl gives Cl– ion, and the two are joined by an ionic bond. ** Ionic Compounds Exist as Crystals. The (+) and (–) ions attract each other with electrostatic force that extends in all directions. This means that ions will be bonded to a number of oppositely charged ions around them. Therefore in solid state, single ionic molecules do not exist as such. ** Rather many (+) and (–) ions are arranged systematically in an alternating cation-anion pattern called the crystal lattice. 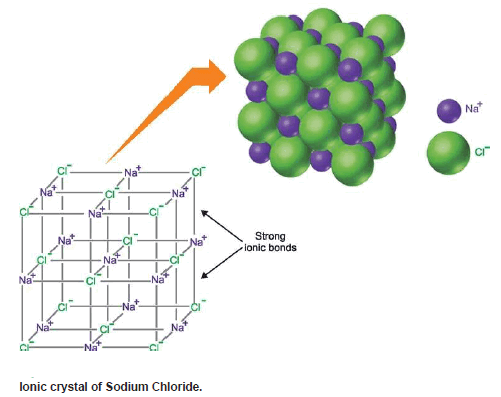 ** The crystal lattice of NaCl is shown Figure. It will be noticed that here a large number of Na+ and Cl– ions are arranged in an orderly fashion so as to form a cubic crystal. 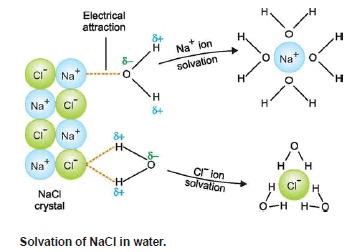 Each Na+ ion is surrounded by 6 Cl– ions and each Cl– ion is surrounded by 6 Na+ ions. This makes a network of Na+ and Cl– ions which are tightly held together by electrostatic forces between them. ** Although discrete molecules Na+Cl– do not exist in the solid form of ionic compounds, independent molecules do exist in the vapour form of such compounds. ** Magnesium (Mg) has two valence electrons, while chlorine (Cl) has seven. ** The magnesium atom transfers its two electrons, one to each chlorine atom, and thus all the three atoms achieve the stable octet. ** In this way Mg atom gives Mg2+ ion and the two Cl atoms give 2Cl1–, forming Mg+2 Cl21- (or MgCl2). ** Calcium (Ca) has two valence electrons, while oxygen (O) has six. Calcium atom transfers its two valence electrons to the same oxygen atom. ** Thus both Ca and O achieve the stable electron-octet, forming Ca2+ and O2– ions. Thus is obtained the molecule of calcium oxide, Ca2+O2–. ** Here the aluminium atom (Al) has three electrons in the valence shell (2, 8, 3), while oxygen has six (2, 6). ** Two atoms of aluminium transfer their six electrons to three oxygen atoms. Thus are the electronoctets of the two Al atoms and three O atoms achieved. 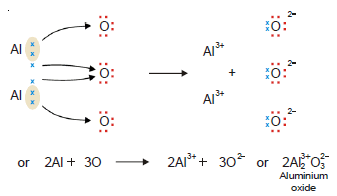 The two Al atoms deprived of three electrons each, give 2Al3+ ions, while the three O atoms having gained two electrons each give 3O2– ions. ** In this way, we get Al2 3+ O3 2- or Al2O3. The ionic compounds are made of (+) and (–) ions held by electrostatic forces in a crystal lattice. Each ion is surrounded by the opposite ions in alternate positions in a definite order in all directions. This explains the common properties of ionic compounds. their allotted positions in the crystal lattice. Since they lack the freedom of movement characteristic of the liquid state, they are solids at room temperature. ** Ionic compounds have high melting points (or boiling points). Since the (+) and (–) ions are tightly held in their positions in the lattice, only at high temperature do the ions acquire sufficient kinetic energy to overcome their attractive forces and attain the freedom of movement as in a liquid. ** Thus ionic compounds need heating to high temperatures before melting. ** The crystals of ionic substances are hard and brittle. Their hardness is due to the strong electrostatic forces which hold each ion in its allotted position. These crystals are made of layers of (+) and (–) ions in alternate positions so that the opposite ions in the various parallel layers lie over each other. ** When external force is applied to a layer of ions , with respect to the next, even a slight shift brings the like ions in front of each other. The (+) and (–) ions in the two layers thus repel each other and fall apart. The crystal cleaves here. ** When a crystal of an ionic substance is placed in water, the polar water molecules detach the (+) and (–) ions from the crystal lattice by their electrostatic pull. These ions then get surrounded by water molecules and can lead an independent existence and are thus dissolved in water. ** By the same reason, non-polar solvents like benzene (C6H6) and hexane (C6H14) will not dissolve ionic compounds. ** Solid ionic compounds are poor conductors of electricity because the ions are fixed rigidly in their positions. ** In the molten state and in water solutions, ions are rendered free to move about. Thus molten ionic compounds or their aqueous solutions conduct a current when placed in an electrolytic cell. The ionic bond involving electrostatic lines of force between opposite ions, is non-rigid and nondirectional. The ionic compounds, therefore, are incapable of exhibiting stereoisomerism. Ionic compounds give reactions between ions and these are very fast.